Veteran trend-watcher Howard Rheingold chronicled the advent of text messaging on mobile phones in Japan in his book Smart Mobs (Perseus Publishing, 2002, 800/386-5656). He has since been struck by the preponderance of Tokyo cell phone users clicking pictures with camera phones. On a visit last year, "it seemed like one in every ten people was framing the world through the lens of their phone," he says. And it's probably only a matter of time before the phenomenon fully takes hold in the United States, he says. "There's no putting this genie back in the bottle," says Rheingold. "I think [the camera phone] is one of the fastest-selling appliances--ever." InfoTrends Research Group predicts that more camera phones will be sold this year worldwide than digital cameras, and that sales will grow rapidly, from 150 million in 2003 to more than 650 million in 2008. "I think [Nokia] is the largest vendor of cameras in the world now," says Rheingold. The devices seem best suited for spontaneously documenting informal events when a digital camera isn't handy. Many people post pictures from their phones to mobile blogging (or "moblogging") sites; the pictures are sent via e-mail, with very little text or none at all. It's all about the pictures. This image sharing is both free and easy, and may soon get easier. Moblogging sites based in the U.S.--such as Textamerica, Fotopages, and Fotolog.net--don't charge anything to post pictures, but doing so requires that you send the photos as e-mail attachments (the e-mail's subject line becomes the title, and the body text becomes the caption). But Rheingold says we'll soon see one-click posting. Likely, a mobile phone maker will build a moblogging platform into its handsets, letting you post photos as you shoot them. After seeing pictures taken with camera phones, it's easy to dismiss them. The picture quality is poor, and the composition tends to look clumsy. But, strangely enough, that seems to be the attraction. Rheingold describes these photo diaries as "sharing [a] flow of perceptions." They're like visual streams of consciousness, which is both their appeal and their limitation. They tend to lack a unifying theme, and they often lack explanations. As I browse moblogs, I'm sometimes left wondering what I'm looking at, and why I should care to sift through the indulgences of an indiscriminate shutterbug. Can strangers' moblogs appeal to the general public? But even if they don't, that doesn't stop the enthusiasts. Chris Hoar, founder of Textamerica, says that a significant number of his site's roughly 100,000 users post 100 photos a month. Elan Dekel, CEO of Fotopages, says teens often post hundreds of pictures a week to his site. Neither limits the number of postings, though Fotolog.net restricts users to six postings a day. Mobile phone carriers allow their customers to send only ten pics per month or fewer to other mobile phones. Sending a photo directly to another user can be easier than attaching it to an e-mail for a moblog posting, but the recipient has to use the same carrier as the sender. Avi Greengart, a senior analyst at Jupiter Research, thinks camera phones are a fad for avid young shutterbugs. But from what I've seen on moblogging sites, plenty of adults are taking the plunge as well. Low resolution doesn't seem to deter many, but it may be why camera phones tend to be used to capture spontaneous and unrehearsed events--the big attraction is that you can share it immediately, and it's handy. A lot of teens chronicle their days in this way, snapping images and then posting them on their moblog. They don't carefully compose the pictures like they would with a conventional camera, notes Mizuko Ito, a cultural anthropologist based at the University of Southern California and Japan's Keio University. Rather, mobloggers seek to add an image to their everyday communication, creating a photo diary. Whether people share their pictures publicly may have more to do with culture than anything else. Ito says that most people she studied in Japan wouldn't share their pictures on a public moblog. But she thinks that as moblogging sites evolve, more people will be comfortable with the idea. Here in the U.S., people don't seem so shy. Fotopages' Dekel says most people post publicly on his site, even though they can choose to keep their moblog private. And Americans may not respond as the Japanese have. Jupiter's Greengart isn't convinced that camera phones will make such a splash here: "U.S. consumers simply aren't all that interested in the camera, per se." His research shows that they'll take a free built-in camera, but that getting the camera is a low priority. He says less than 10 percent of all mobile phone owners in the U.S. have taken a picture. "First of all, they're lousy photos. Secondly, they're not taken in the same way a regular photo is taken, and that's partly due to the resolution," Greengart says. Even if you're not a teen recording the details of a dreary adolescence, you can be a potential news reporter if you carry a camera phone. 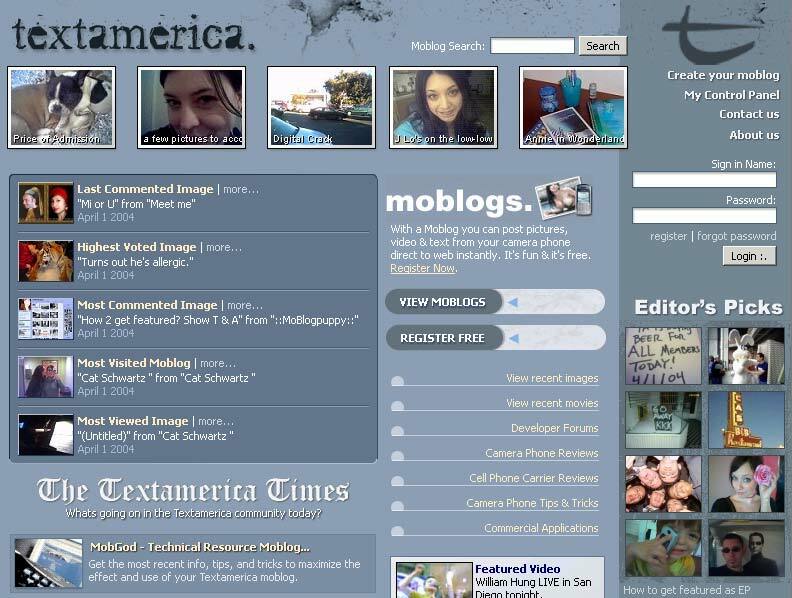 During last year's San Diego wildfires, Textamerica dedicated a moblog to pictures of the disaster, as it had done for the 2003 blackout in the Northeast. The BBC might have been the first major news organization to post on its site pictures taken with camera phones, setting up a moblog in February 2003 about antiwar rallies in London. More recently, in November 2003 the BBC provided a Web page for London's anti-Bush rallies. The San Diego Union Tribune's news moblog doesn't have a unifying event; readers just post photos of their own choosing. The newspaper also hosts a sports moblog. As more camera phones end up in people's pockets, we'll likely see their photos showing up in newspapers and on TV news. But what could really launch widespread use of amateur footage is the inevitable video phone, says Rheingold. "That's going to change news, I think, when a major event happens and three or four or one hundred people have video of it and can send it directly to the Web," he says. Mobloggers might even compete with traditional news outlets like CNN, or news channels might buy the best footage of an event. Of course, in an age when Photoshop has become a verb, the need to prove authenticity will remain. "You can fake that stuff," says Rheingold. His hope is that it will be "self-correcting": as long as other people have the same footage, unaltered, we'll know when someone is taking digital liberties. Have comments on The Human Element? Contact Eric Butterfield.